Osama bin Mohammed bin Awad bin Laden (; , ; March 10, 1957– May 2, 2011) was the founder of the militant Islamist organization Al-Qaeda, the jihadist organization responsible for the September 11 attacks on the United States and numerous other mass-casualty attacks against civilian and military targets. He was a member of the wealthy Saudi bin Laden family, and an ethnic Yemeni Kindite. 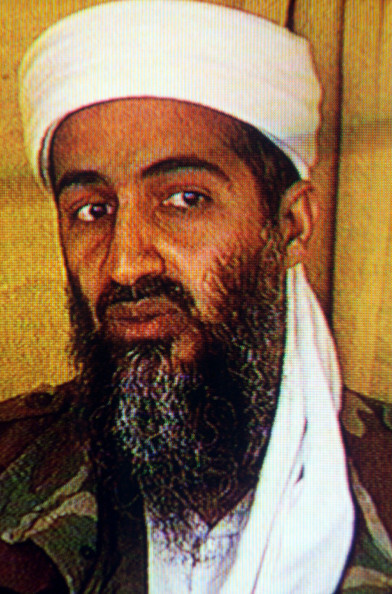 Bin Laden was on the American Federal Bureau of Investigation's lists of Ten Most Wanted Fugitives and Most Wanted Terrorists for his involvement in the 1998 U.S. embassy bombings. From 2001 to 2011, bin Laden was a major target of the War on Terror, with a bounty by the Federal Bureau of Investigation. After being placed on the FBI's Most Wanted list, bin Laden remained in hiding during three U.S. presidential administrations. On May 2, 2011, bin Laden was shot and killed inside a private residential compound in Abbottabad, Pakistan, by U.S. Navy SEALs and CIA operatives in a covert operation ordered by United States President Barack Obama. Shortly after his death, bin Laden's body was buried at sea. Al-Qaeda acknowledged his death on May 6, 2011, vowing to retaliate. Osama bin Mohammed bin Awad bin Laden was born in Riyadh, Saudi Arabia, a son of Mohammed bin Awad bin Laden, a billionaire construction magnate with close ties to the Saudi royal family, and Mohammed bin Laden's tenth wife, Hamida al-Attas . In a 1998 interview, bin Laden gave his birth date as March 10, 1957. Bin Laden was raised as a devout Wahhabi Muslim. From 1968 to 1976, he attended the élite secular Al-Thager Model School. He studied economics and business administration at King Abdulaziz University. Some reports suggest he earned a degree in civil engineering in 1979, or a degree in public administration in 1981. One source described him as "hard working", another said he left university during his third year without completing a college degree. At university, bin Laden's main interest was religion, where he was involved in both "interpreting the Quran and jihad" and charitable work. Other interests included writing poetry; reading, with the works of Field Marshal Bernard Montgomery and Charles de Gaulle said to be among his favorites; black stallions; and association football, in which he enjoyed playing at centre forward and followed the fortunes of Arsenal F.C. In 1974, at the age of 17, bin Laden married Najwa Ghanem at Latakia, Syria; they were divorced before September 11, 2001. Bin Laden's other known wives were Khadijah Sharif , Khairiah Sabar , Siham Sabar , and Amal al-Sadah . Some sources also list a sixth wife, name unknown, whose marriage to bin Laden was annulled soon after the ceremony. Bin Laden fathered between 20 and 26 children with his wives. Many of bin Laden's children fled to Iran following the September 11 attacks and Iranian authorities reportedly continue to control their movement. Bin Laden's father Mohammed died in 1967 in an airplane crash in Saudi Arabia when his American pilot misjudged a landing. Bin Laden's eldest half-brother, Salem bin Laden, the subsequent head of the bin Laden family, was killed in 1988 near San Antonio, Texas, in the United States, when he accidentally flew a plane into power lines. The FBI described bin Laden as an adult as tall and thin, between 6 ft 4 in and 6 ft 6 in (193–198 cm) in height and weighing about 165 pounds . Interviewer Lawrence Wright, on the other hand, described him as quite slender, but not particularly tall. Bin Laden had an olive complexion and was left-handed, usually walking with a cane. He wore a plain white turban and he had stopped wearing the traditional Saudi male headdress. Bin Laden was described as soft-spoken and mild-mannered in demeanor. Osama bin Laden was killed in Pakistan on May 2, 2011, shortly after 1 a.m. local time by a United States special forces military unit. The operation, code-named Operation Neptune Spear, was ordered by United States President Barack Obama and carried out in a U.S. Central Intelligence Agency operation by a team of United States Navy SEALs from the United States Naval Special Warfare Development Group of the Joint Special Operations Command, with support from CIA operatives on the ground. The raid on bin Laden's compound in Abbottabad, Pakistan was launched from Afghanistan. After the raid, U.S. forces took bin Laden's body to Afghanistan for identification, then buried it at sea within 24 hours of his death. Critics accused Pakistan's military and security establishment of protecting bin Laden. For example, Mosharraf Zaidi, a leading Pakistani columnist, stated, "It seems deeply improbable that bin Laden could have been where he was killed without the knowledge of some parts of the Pakistani state." Pakistan's president Asif Ali Zardari denied that his country's security forces sheltered bin Laden, and called any supposed support for bin Laden by the Pakistani government "baseless speculation". It was speculated that the issue might further strain U.S. ties with Pakistan. Bin Laden was killed in what some suggest was his residence for five years. It was an expensive compound located less than a mile from Pakistan's version of West Point, probably built for him and less than 100 kilometers' drive from the capital. The Pakistani government's foreign office issued a statement that "categorically denies" any reports by the media that the country's leadership, "civil as well as military, had any prior knowledge of the U.S. operation against Osama bin Laden". Pakistan's United States envoy, ambassador Husain Haqqani, promises a "full inquiry" into how Pakistani intelligence services failed to find bin Laden in a fortified compound, just a few hours drive from Islamabad, and stated that "obviously bin Laden did have a support system; the issue is, was that support system within the government and the state of Pakistan or within the society of Pakistan?" Whole or part of the information contained in this card come from the Wikipedia article "Osama bin Laden", licensed under CC-BY-SA full list of contributors here.